Discover our traditional collection of finely fragranced signature soaps, all hand wrapped and triple milled with vegetable base to produce a rich and creamy lather. Our number one Summer Soap for Women: Stephanotis - Exhilarating notes of orange blossom enlivened with the soft spiciness of carnation contrasted with a green lily of the valley accord are evocative of the intensely fragrant stephanotis blossom. The floral heart, sustained by jasmine and coriander leads to the base notes of sandalwood and musk. Our number one Summer Soap for Men: Cefiro - Cefiro is a fragrance perfectly suited for men and women, with crisp lemon and lime, punctuated with bergamot and mandarin, warmed by spicy notes of cardamom and nutmeg on a fresh floral jasmine heart that leads to a clean, musky, woody base. 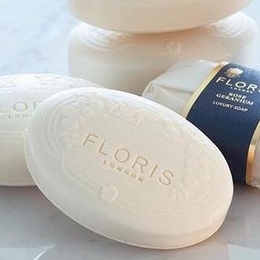 Kindly scroll down to view complete FLORIS Luxury Soap range.